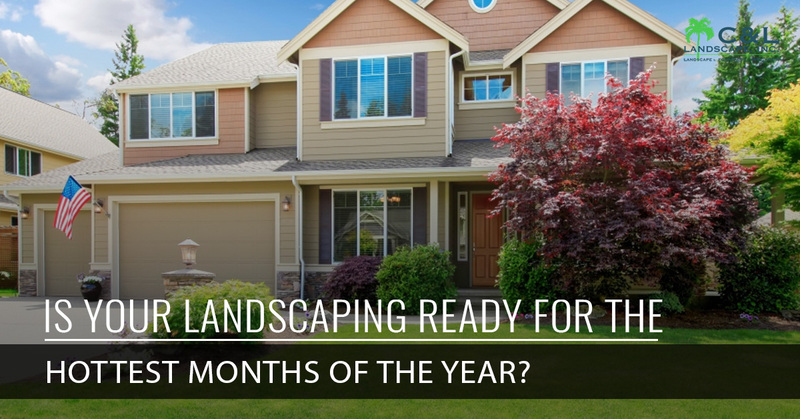 Is Your Landscaping Ready For The Hottest Months Of The Year? July is the hottest month of the year here in Jacksonville, followed closely by August. With average highs of 92-degrees and 91-degrees in July and August respectively, there are a few things to take into consideration concerning your landscape. Keep reading to learn how C & L Landscape can help you protect your yard this summer! When mowing your lawn, refrain from cutting it too short, as this not only depletes the grass’s ability to regrow, but also exposes the shallow roots to high temperatures when the sun beats down. The length of your grass will greatly depend on the species, and our local landscapers can help you determine a good blade height to set on your mower. Additionally, while it might seem natural to grab the fertilizer or weedkiller at the first sign of dying grass, doing so during the heat of summer can actually have negative effects because they kill the healthy microbes that help keep your lawn lush and green. Not only must you ensure that your landscape doesn’t get scorched, but you also must ensure it can drain properly after the summer storms. We know here that when it rains, it pours, and the hottest months of the year also line up with the wettest months. Homes that have landscaping with poor or non-existent drainage systems can experience mosquito-attracting standing water, sloshy grass that will eventually die, and water that can even leak into the home. If your yard floods every year, it might be the time to invest in a better landscaping plan that will allow for water to flow off of your yard, rather than pooling in the middle of it. We can help install various drainage systems based on what will work best for your yard, but one option is to embrace the water and install a rain garden. Rain gardens are the epitome of making lemonade out of lemons. Rather than trying to direct water away from a low spot in your yard, you instead embrace the area where water pools with a small garden of water-loving plants. A typical rain garden is dug about 8-12 inches deep and filled with a healthy soil, as well as native plants with deep roots. Even though water will still collect here, it will absorb faster into the ground and nourish the plants, rather than pooling up and attracting bugs. As your landscapers, we can help you pick out the best plants for the job. If your grass is turning yellow and you are not sure why, call C & L Landscape! Sometimes it can be hard for the untrained eye to determine if grass needs more water, less water, or something else entirely. We can help you keep your grass green throughout the summer, ensure proper drainage, and diagnose problems as they come up. Get in touch with your Jacksonville landscapers today!